You are here: Home › NEWS › Crane Accessories › News & Information › Pedestrian Operated Tower Crane Hire › Training and Support › Mantis Cranes Travel Mugs Giveaway! We’ve decided that it’s time to reward our social media followers once again so we’re giving away five of our Mantis Cranes Travel Mugs. To be in with a chance to win one mug simply follow us on Facebook or Instagram, and like and share our post showing the picture below, before next Friday June 23 at 3pm. Full terms and conditions at the bottom of this post. 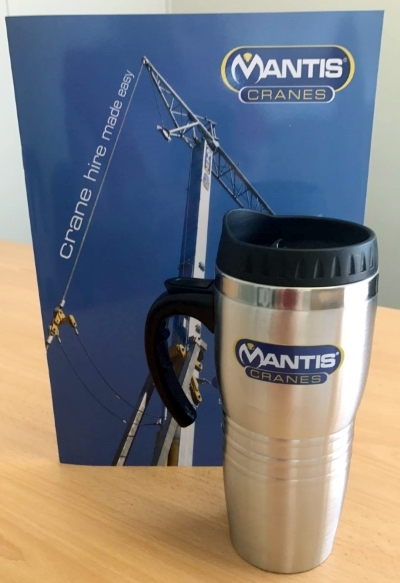 Win one of our Mantis Cranes Travel Mugs! The competition is open to residents of the United Kingdom or the Republic of Ireland over the age of 18 except employees of Mantis Cranes. Winners will be chosen at random by software from all entries received.